With its many compartments, this briefcase is great for the business person "on the go." 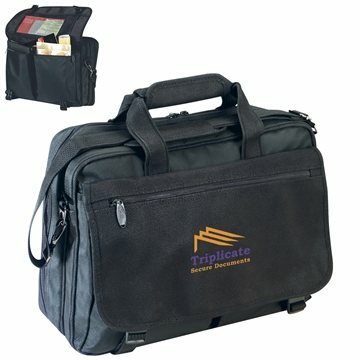 This bag features maximum organizer pockets to hold all of your documents and business accessories. Two large zippered main compartments. Organizer pocket with mesh pocket, large zip pockets and pen organizers. This is among the best products we have purchased. Looked like a good quality product, great value for price. We were very pleased with the product and the service that we received from Rosa. Good cost, top quality, great service! It is a very sturdy cup and the color was perfect. Nice product for the cost and number needed, small order amount expedited with respect. the product was exactly as portrayed on the website and via the proof there were no surprises and overall the experience was painless and worry free. Great giveaway.